And I’m bringing the cake. 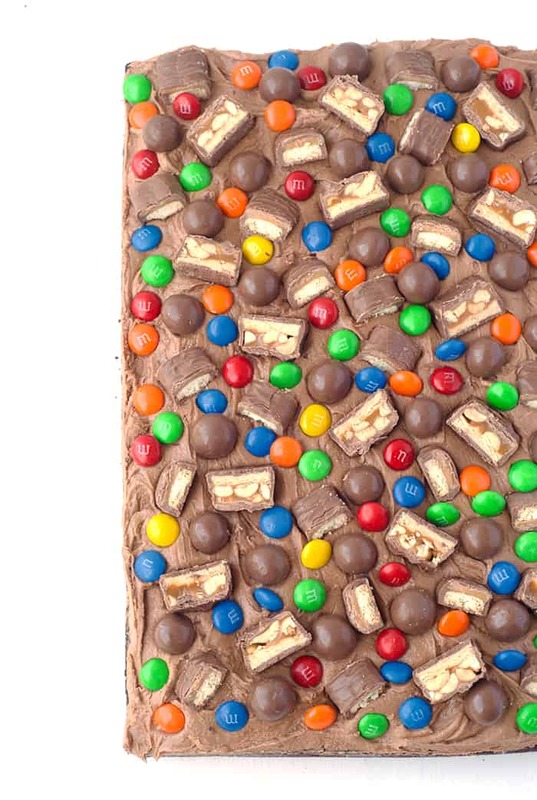 A Candy Covered Chocolate Sheet Cake to be exact, with lashes of chocolate frosting and LOADS of candy, including Snickers, Twix, Maltesers and M&M’s. Party time indeed! If you’re on the hunt for a cake that feeds a crowd, this 👆🏻 is your answer. 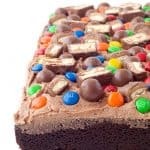 A giant sour cream chocolate cake that boasts an incredibly light and tender crumb, plenty of creamy chocolate frosting and a boatload of crispy, crunchy candy. I had a major craving for chocolate cake this week, so I decided to go all out with a giant chocolate sheet cake. 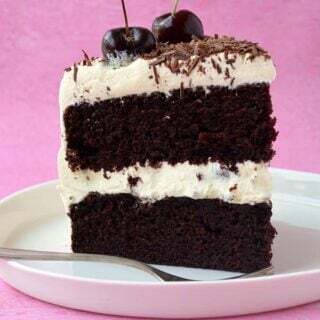 But this isn’t any chocolate cake, this is a sour cream chocolate cake. Sour cream is my new secret weapon in making truly lovely moist cakes, that just about melt-in-your-mouth. 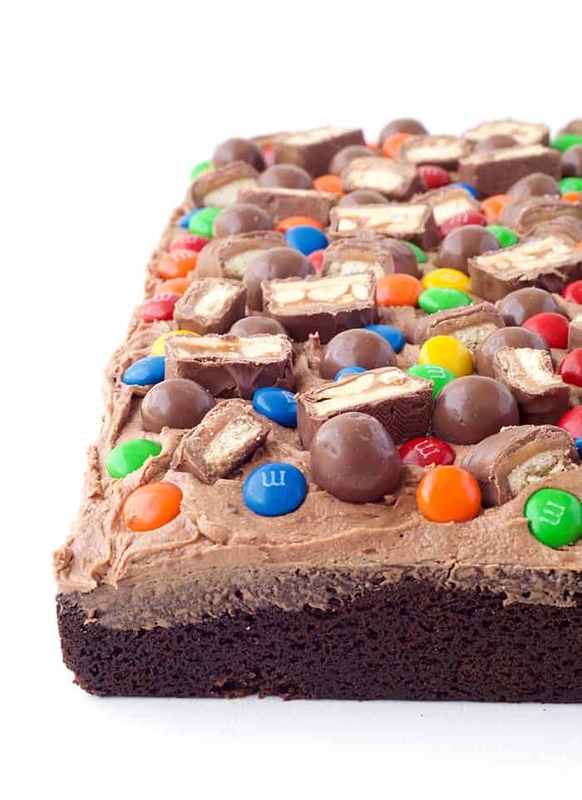 Add to that plenty of chocolate frosting – made using REAL chocolate rather than cocoa powder – AND all your favourite candy and you have the perfect party cake, am I right? 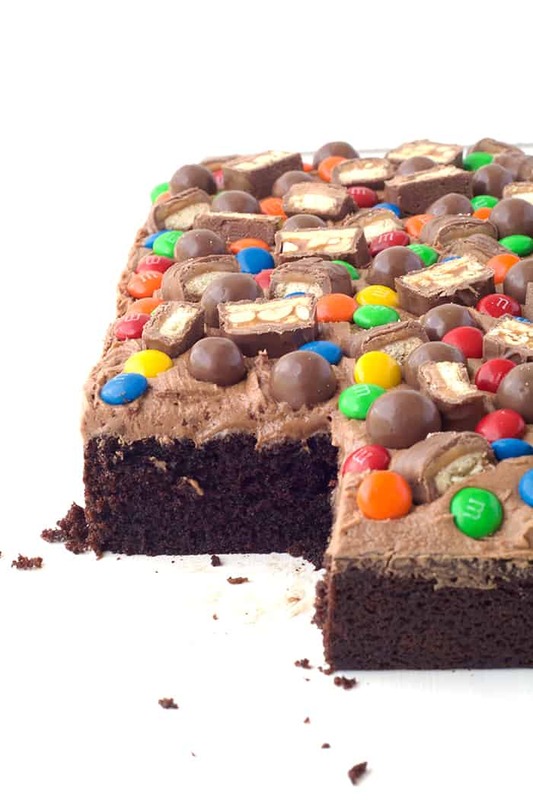 Of course, you could use whatever candy you like to decorate your cake. But I love the chewiness of the Snickers pieces, the crunch of the Twix biscuit and the pop of colour from all the M&M’s. But you could easily customise this cake to suit any occasion or theme. I’ve already eaten two big slices of this cake and I just want more. So if you need to feed a crowd or are hosting a party anytime soon, look no further for your celebration or birthday cake. 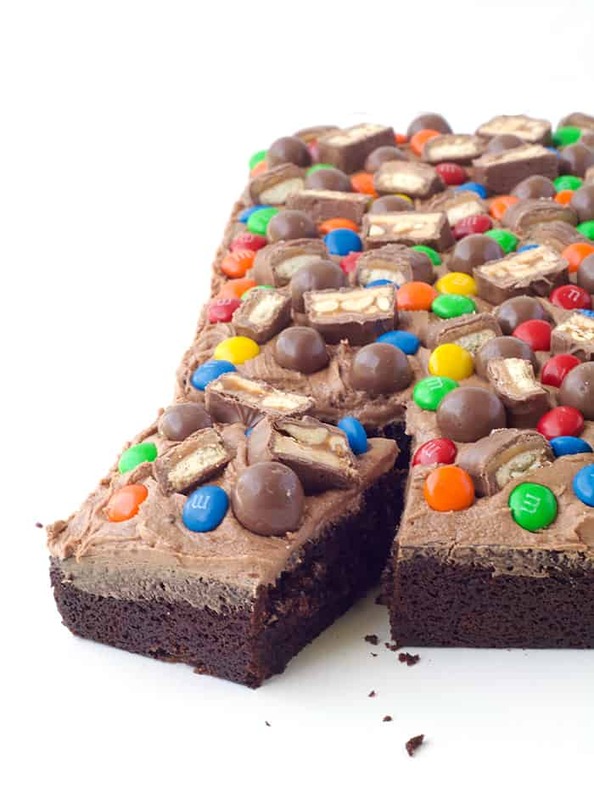 This Candy Covered Chocolate Sheet Cake is a total crowd-pleaser! I hope you’ve had a great weekend. They go so fast don’t they? I spent most of my weekend in the kitchen. As well as this cake, I’ve also been testing a brownie recipe for the blog. I’ve done 3 tests and I’m still not 100% satisfied with the result but I feel I’m very very close. In the meantime, this Chocolate Sheet Cake is more than satisfying my chocolate cravings. I’m taking the rest of it to work today because it is dangerous having a giant cake in a house of two! Enjoy friends! 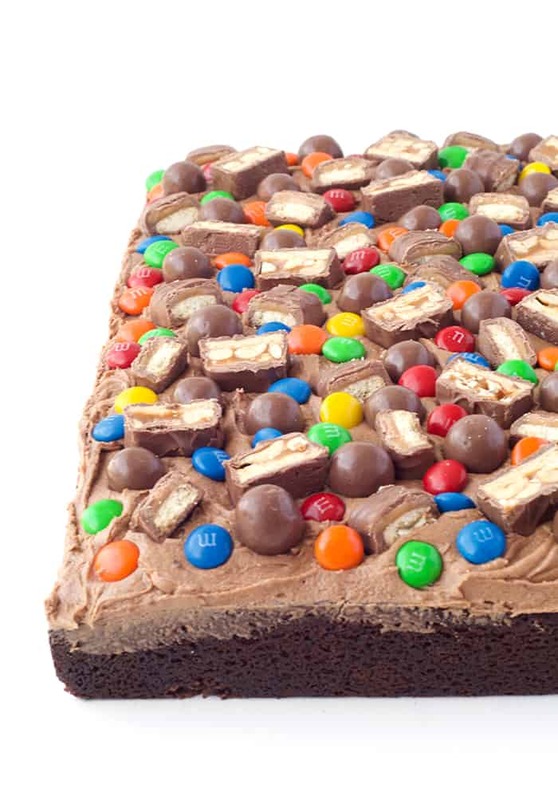 Candy Covered Chocolate Sheet Cake with lashes of chocolate frosting and LOADS of candy, including Snickers, Twix, Maltesers and M&M’s. Grease your rectangular cake tin (9 x 13 inch (23 x 33 cm)) with butter and line with baking or parchment paper making sure two sides overhang. Preheat the oven to 160 (320 F). In a large mixing bowl, cream the butter and sugars with an electric mixer until pale, approximately 4 minutes. Add the vanilla extract and beat again. Add one egg at a time and continue to beat until mixture is combined and creamy. Boil the kettle and pour out 1/2 cup water and set aside. In a separate bowl, sift the plain flour, cocoa powder, baking powder and baking soda and lightly whisk. Add the dry ingredients to the wet, along with half of the hot water and gently fold with a spatula. Add the rest of the hot water and continue to fold. Add the sour cream and fold until the mixture is completely combined and smooth. It will be quite thick – this is fine. 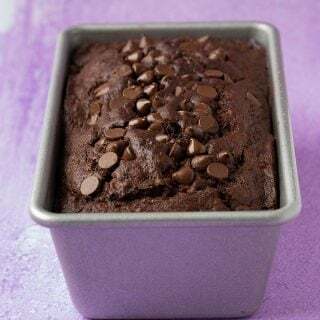 Pour the chocolate batter into your prepared bundt pan and then bake for approximately 35 minutes or until a skewer inserted into the middle of the cake comes out clean. Leave the cake to cool for about 15 minutes before carefully transferring to a wire rack to cool completely. 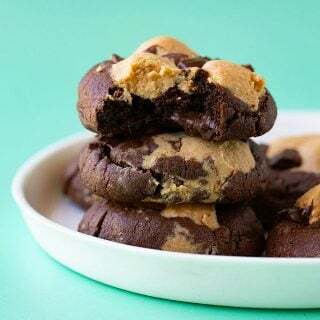 To make the frosting, place your softened butter in a large mixing bowl and beat with an electric mixer on medium speed for a couple of minutes until pale and creamy. Meanwhile melt the chocolate in a microwave, stirring in between 20 second bursts, until just melted and set aside to cool a little. Once the butter is very pale and creamy, add in half of the powdered sugar and one tablespoon of milk and beat on low until the sugar is incorporated and then beat on medium speed until combined. Next, add the rest of the sugar and the milk, and again beat on slow until the sugar is incorporated before turning up to medium for another minute or so. Next, add in your melted chocolate to the buttercream mixture, ensuring the chocolate is still smooth and melted but is not warm. Beat until the chocolate is completely mixed through. Gently cover your cooled cake with chocolate frosting. Then scatter over all your candy pieces right before serving. 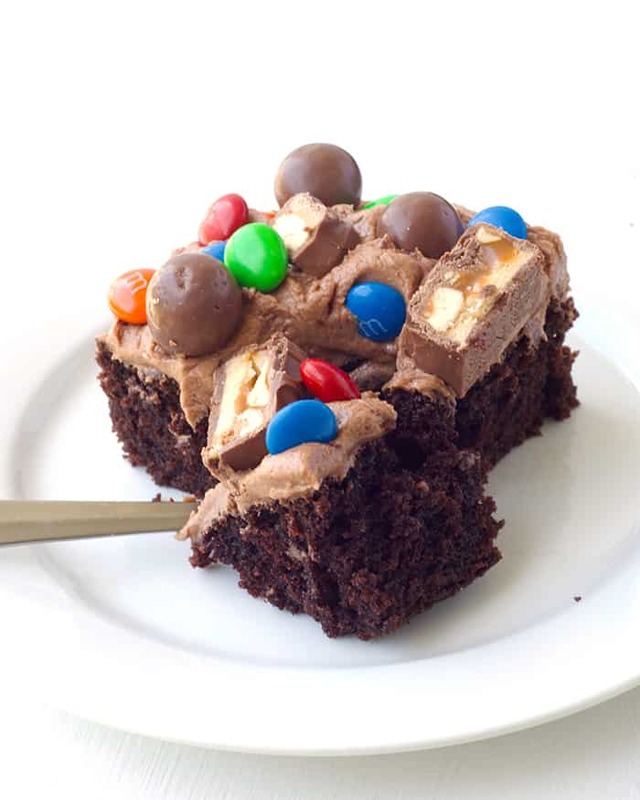 *I used M&M’s, Maltesers, Twix bars and Snickers bars. This is the softest chocolate cake I’ve ever had! Thanks Josh, so glad you loved this cake – it’s one of my faves! I’m an Aussie girl living in Germany and brown sugar as we know it in Australia is impossible to find here. Will the cake work using just caster sugar or would a mix of caster and raw sugar be a suitable alternative to the brown sugar? Ummmmm, I feel like this is the kind of cake which you make for a party and then are SUPER disappointed when it disappears in 0.00000001 seconds and there’s no leftover cake to eat post party 😛 YUMM!